Base ten blocks make math easy and fun, even third power algebra. Left off an equals sign but you get the point. He factored it two ways and then realized that factoring it down to (3x-2)(x+1)(x+2) would cover all of them…he knew without thinking very hard that x² + 3x + 2 = (x+1)(x+2) and that 3x² + 4x + 4 was just (3x-2)(x+2) so the “last way” was just going to be (3x-2)(x+1) and the other factor of (x+2). So basically he discovered on his own why "we factor it down as far as we can go." Take 18 for example, 3x3x2 covers all the bases. 2x9, 3x6 same thing, 18. Just depends on how you multiply the factors. 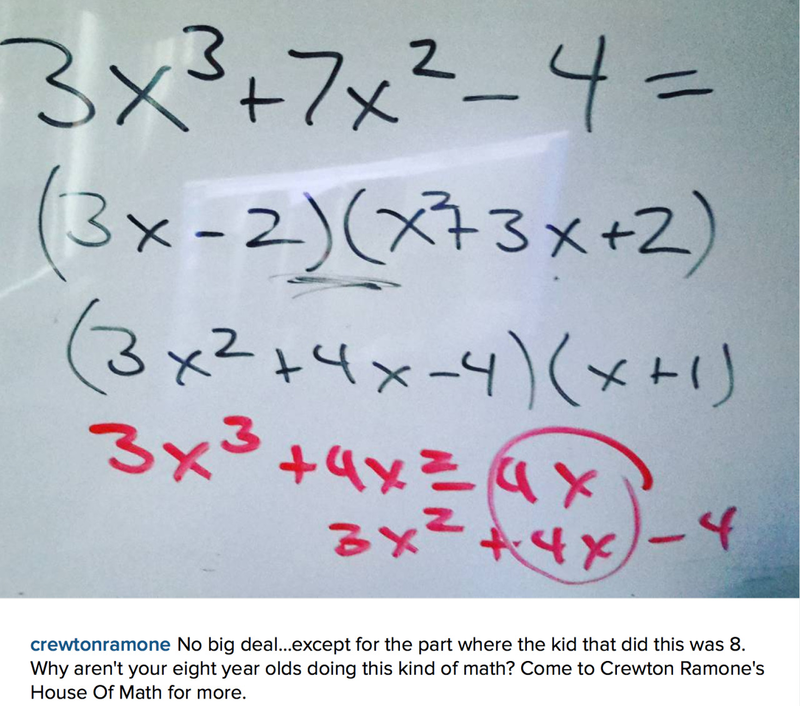 I use algebra to teach all manner of math concepts. Not only that, you teach more faster because you can compound the lessons. I leave x³ - 64 for you the reader to do on your own time...might want to start at x³ - 1 with basic ops pieces and work your way up...drawing as you go. Click here for more third power algebra. We did a few more problems not shown here but they were variations on the drawings you do see. If these drawings make no sense to you or you are new here go explore over at my house of math. The other student was 11. But as he says, "once you get to 10, nobody is impressed you can do algebra." 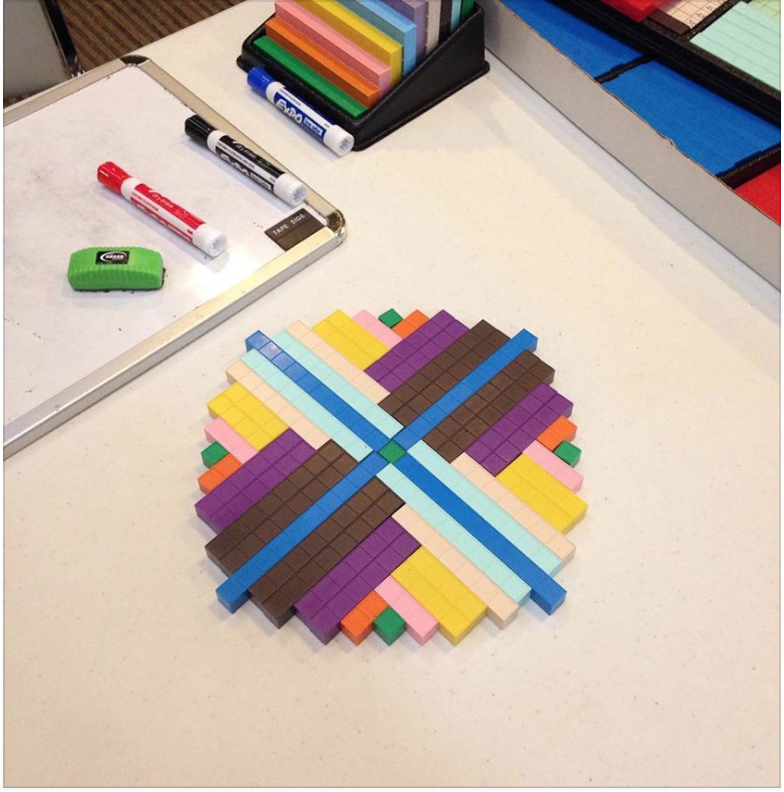 I'm pretty sure there are still plenty of people who are impressed when all you see is symbols...but what these kids do is see the symbols and translate them into geometric figures that can be easily counted and manipulated in their heads or if need be with the aid of sketches on paper. They have been factoring polynomials since they were little, just like these two. Algebra is important. It is the greatest labor saving device ever devised by the mind of man and yet it is currently the most failed subject out there. If you work in retail or fast food, you won't need the algebra much unless you get into top management. 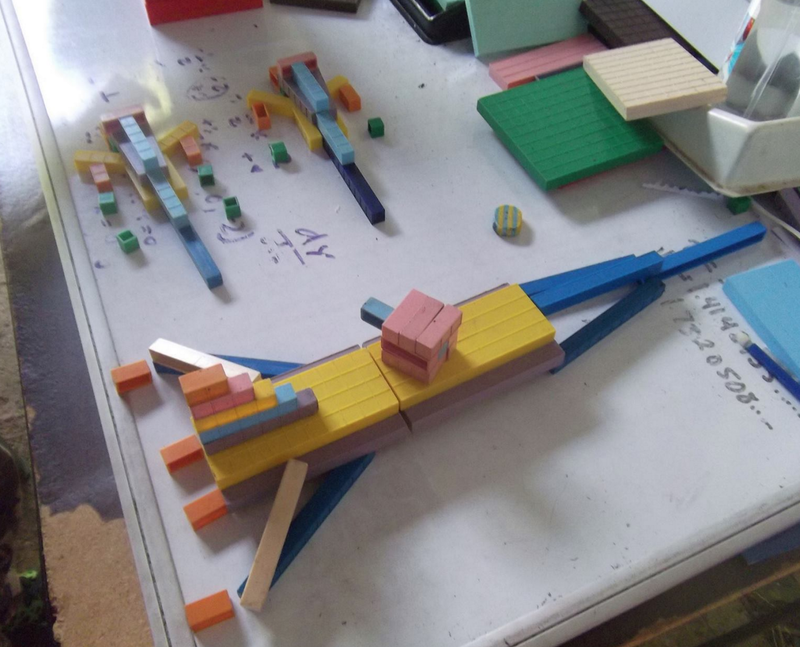 But if you are in the sciences or engineering or architecture you will use algebra EVERYDAY. How do I know? Because when ever I am around engineers or scientists or architects I ask them, "how often do you use the algebra?" And the answer is always: "EVERYDAY." Third (and 4th) power algebra, negative expressions, integers and more are covered in depth on the advanced algebra page. You'll need a password though. 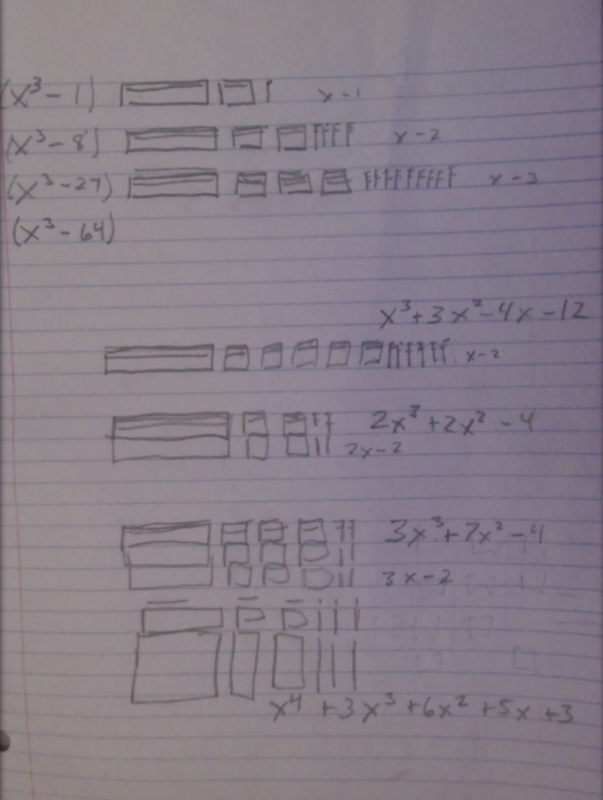 The lessons go like this...I give them the symbols for example x³ - 27 and they have to give me the drawings or just give me the factors...this is exceptionally effective for teaching much more than just factoring polynomials, it can also be used to teach remedial math. 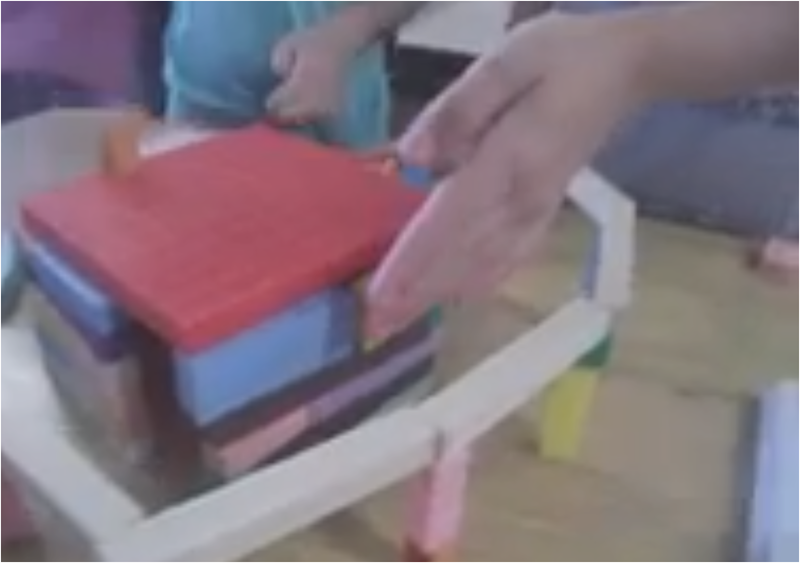 Concept based teaching with base ten blocks works. I can show you how, Find me on facebook, twitter, tumblr, instagram etc. 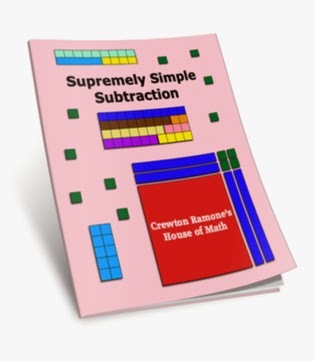 If "advanced algebra" for your 8 year old is too much for you maybe you could start with subtraction...here is a FREE SUBTRACTION BOOK to get you started, soon stuff like you see here will be child's play.